Managers must be conscious that markets, supplies, investors, locations, partners, and competitors can be anywhere in the world. Successful businesses will take advantage of opportunities wherever they are and will be prepared for downfalls. Successful managers, in this environment, need to understand the similarities and differences across national boundaries, in order to utilize the opportunities and deal with the potential downfalls. The globalization of business is easy to recognize in the spread of many brands and services throughout the world. For example, Japanese electronics and automobiles are common in Asia, Europe, and North America, while U.S. automobiles, entertainment, and financial services are also common in Asia, Europe, and North America. Moreover, companies have become transnational or multinational-that is, they are based in one country but have operations in others. For example, Japan-based automaker Honda operates the largest single factory in the United States, while U.S. based Coca-Cola operates plants in other countries including France and Belgium—with about 80 percent of that company's profits come from overseas sales. During the early1990s, there were reasons to feel that globalization was working. The economic success of Singapore, the rapid economic growth in the Asian Tigers (as the Asian countries that grew rapidly were called), the industrializing of countries, such as Brazil and Mexico, and a variety of other positive economic events around the world suggested that the results of globalization were indeed good for development in poorer countries, as well as in richer ones. During the 1990s, the United States experienced one of its most sustained periods of growth as well, and there was much talk of a "new economy", based on globalization, which was immune to economic shocks and recession. Unfortunately, this rapid growth was not without consequences. The Seattle meetings of the World Trade Organization turned into a fiasco, with anti-globalization groups demonstrating against globalization on all fronts—from animal rights to environmental concerns, poverty alleviation, and jobs for Americans. The anti-globalization forces have not coalesced into a coherent whole because they represent such diverse and often contradictory views. The vehemence of their protests, however, make it clear that globalization is not a panacea for the world's problems. In addition, the Asian Tigers suffered major economic setbacks in the late 1990s. In 2002, Argentina's economy, which had been one of the stars of the 1990s, crashed, when the country could no longer maintain its currency at par with the U.S. dollar. Further problems occurred in the Triad economies. Japan, Europe, and the United States, often referred to as the Triad, dominated international trade and investment for much of the second half of the twentieth century. The Japanese economy went into a severe period of recession and deflation in the late 1990s, and in 2001 both the European and the U.S. economies took a downward turn as well. In turn, the rest of the world was negatively affected by the economic situation in the Triad. The terrorist attacks in the United States in September, 2001, exacerbated this already negative economic situation. In developing appropriate global strategies, managers need to take the benefits and drawbacks of globalization into account. A global strategy must be in the context of events around the globe, as well as those at home. appeal to customers in other countries. Some rudimentary aspects of international strategies mirror domestic strategies in that companies must determine what products or services to sell, where and how to sell them, where and how they will produce or provide them, and how they will compete with other companies in the industry in accordance with company goals. The development of international strategies entails attention to other details that seldom, if ever, come into play in the domestic market. These other areas of concern stem from cultural, geographic, and political differences. Consequently, while a company only has to develop a strategy taking into account known governmental regulations, one language (generally), and one currency in a domestic market, it must consider and plan for different levels and kinds of governmental regulation, multiple currencies, and several languages in the global market. The most recent wave of globalization by U.S. companies began in the 1980s, as companies began to realize that concentrating on the domestic market alone would lead to stagnant sales and profits and that emerging markets offered many opportunities for growth. Part of the motivation for this globalization stemmed from the lost market share in the 1970s to multinational companies from other countries, especially those from Japan. Initially, these U.S. companies tried to emulate their Japanese counterparts by implementing Japanese-style management structures and quality circles. After adapting these practices to meet the needs of U.S. companies and recapturing market share, these companies began to move into new markets to spur growth, enable the acquisition of resources (often at a cost advantage), and gain competitive advantage by achieving greater economies of scale. The globalization of U.S. companies has not been without concerns and detractors. Exporting U.S. jobs, exploiting child labor, and contributing to poverty have all been charges laid at the doors of U.S. companies. These charges have been accompanied by demonstrations and consumer boycotts. Nor have U.S. companies been the only ones affected. Companies in the rest of the developed world have globalized along with U.S. companies, and they have also faced the sometimes negative consequences. Interestingly, in the late twentieth and early twenty-first century, there has also been a growth in international companies from developing and transitional countries, and this trend can be expected to continue and increase. Exports and investment from the People's Republic of China are a notable example, but companies from Southeast Asia, India, South Africa, and Latin America, to name some countries and regions, are making themselves known around the world. Businesses may choose to globalize or operate in different countries in four distinct ways: through trade, investment, strategic alliances, and licensing or franchising. Companies may decide to trade tangible goods such as automobiles and electronics (merchandise exports and imports). Alternatively, companies may decide to trade intangible products such as financial or legal services (service exports and imports). Companies may enter the global market through various kinds of international investments. Companies may choose to make foreign direct investments, which allow them to control companies and assets in other countries. In addition, companies may elect to make portfolio investments, by acquiring the stock of companies in other countries in order to gain control of these companies. Another way companies tap into the global market is by forming strategic alliances with companies in other countries. While strategic alliances come in many forms, some enable each company to access the home market of the other and thereby market their products as being affiliated with the well-known host company. This method of international business also enables a company to bypass some of the difficulties associated with internationalization such as different political, regulatory, and social conditions. The home company can help the multinational company address and overcome these difficulties because it is accustomed to them. Finally, companies may participate in the international market by either licensing or franchising. Licensing involves granting another company the right to use its brand names, trademarks, copyrights, or patents in exchange for royalty payments. Franchising, on the other hand, is when one company agrees to allow a company in another country to use its name and methods of operations in exchange for royalty payments. Generally, a company develops its international strategy by considering its overall strategy, which includes its operations at home and abroad. we can consider four aspects of strategy: (1) scope of operations, (2) resource allocation, (3) competitive advantage, and (4) synergy. The first component encompasses the geographic locations—countries and regions—of possible operations as well as possible markets or niches in various regions. Since companies have limited resources and since different regions offer different advantages, managers must select the markets that offer the company the optimal opportunities. The second component of the global strategy focuses on use of company resources so that a company can compete successfully in the chosen markets. This component of strategy planning also determines the relative importance of various company functions and bases the allocation of resources on the relative importance of each function. For instance, a company may decide to allocate its resources based on product lines or geographical locations. Next, management must decide where the company can achieve competitive advantage over other companies in the industry. Management can identify their competitive advantage by determining what the company does better (or can do better) than its competitors. Companies may realize this advantage through a host of techniques such as using superior technology, implementing more efficient organizational practices and distribution systems, and cultivating well-known brands. This component of the strategy involves not only identifying existing or potential areas of competitive advantage but also developing a plan for sustaining areas of competitive advantage. Finally, global strategy should involve establishing a plan for the company that enables its various functions and operations to benefit one another. For example, a company can use one line of products to encourage sales of another line of products and thereby enabling different parts of a business to benefit from each other. Many companies are now outsourcing many of their operations internationally. For example, if you call to get information on your credit card, you may well be talking to someone in India or Mexico. Equally, manufacturers often outsource production to low labor cost countries. Concerns over ethical issues, such as slave and child labor, have led to companies outsourcing under controlled conditions—offshore production may be subject to surprise visits and searches and outsourced factories are required to conform to specific criteria. Strategy development itself generally takes places in two stages: strategy formulation and strategy implementation. When planning a strategy, companies identify their international objectives and put together a strategy that will enable them to realize their goals. During the planning stage managers propose, revise, and finally ratify plans for entering new markets and competing in them. After a strategy has been agreed on, managers must take steps to have it implemented. Consequently, this stage involves determining when to begin global operations as well as actually starting operations and putting into action the other components of the global strategy. More specifically, the first stage—strategy formulation—entails analysis of the company and its environment, establishing strategic goals, and developing plans to achieve goals as well as a control framework. By assessing itself and the global business environment, a company can determine what markets, products, services, etc. offer opportunities for growth. This process involves the collection of data on a company and its environment, including information on global markets, regulation, productivity, costs, and competitors. Therefore, the collection of data should supply managers with economic, financial, political, legal, and social information on various countries and their markets for different products or services. Based on this information, managers can determine what markets and products offer economically feasible opportunities for global expansion. Once this analysis is complete, managers must establish strategic goals, which are the significant goals a company seeks to achieve through a particular pursuit such as entering a new regional market. These goals must be practicable, measurable, and limited to a specific time frame. After the strategic goals have been established, companies should develop plans that allow them to accomplish their goals, and these plans should concentrate on how to implement strategic plans. Finally, strategy formulation involves a control framework, which is a process management uses to help ensure that a company remains on the right course when implementing its strategic plans. The control framework essentially responds to various developments while the strategic plans are being implemented. For example, if sales are lower than the projected sales that are part of the strategic goals, then a company might increase its marketing efforts and temporarily lower its prices to stimulate additional sales. While many aspects of international strategy and its formulation are similar to their domestic counterparts, some key aspects are not, and hence call for different methods and different kinds of information. Gaining knowledge of international markets is one of these key differences—and a crucial part of developing an international strategy. In order for a company to enter a new market, capture market share, and thereby increase sales and profits, it must know what that market is like. At a basic level, a company must examine different markets, evaluate the advantages and disadvantages of entering each, and select only the markets that show the greatest potential for entry and growth. products or services. Managers also should consider the currency stability of the different markets, which can be done by using documents from the home countries to determine currency value and fluctuation over a period of years. To select the best markets for entry, managers also should consider the degree of competition within different markets and should anticipate future competition in them as well. Determining the degree of competition involves the identification of all the companies competing in the prospective markets as well as their sizes, market shares, and prices. Managers then should evaluate a prospective market by considering the number of competitors and their characteristics as well as the market conditions—that is, whether the market is saturated with competition and cannot support any new entrants. Next, managers should evaluate the regulatory environment of the prospective markets, since knowing tax, trade, other related policies is essential for a successful international business. This step entails determining the respective tariffs and trade barriers of prospective markets. Different types of trade barriers may influence the kind of business activity a company chooses for a particular market. For example, if a prospective market has trade barriers that restrict the entry of foreign-made goods, a company might decide to access the market through foreign direct investment and manufacture its products in that country itself. Ownership restrictions also may limit a company's interest in a particular market; some countries permit foreign companies to set up local operations only if they establish a partnership with a local company. In addition, managers should find out if prospective countries charge foreign companies higher taxes or if they offer tax breaks and incentive to encourage economic development. A final consideration companies must make concerning government is stability. Since some countries have rough government transitions resulting from coups and uprisings, companies must countenance the possibility of political turmoil that could substantially disrupt business. The last step in international market evaluation is the assessment of cultural factors. To avoid difficulties associated with cultural differences, some managers look for new markets that have cultural similarities to their home market, especially for initial international market penetration endeavors. Unlike market potential, competition, and regulation, cultural differences are more difficult to evaluate. Nevertheless, managers must try to determine the consumer needs and preferences in the prospective markets. Managers must also account for cultural differences in labor relations such as worker motivation, compensation, hours, etc. if planning foreign direct investment in an overseas company. Moreover, a thorough understanding of a prospective country's culture will greatly facilitate any kind of global business enterprise. This cultural knowledge should include a basic understanding of a prospective country's beliefs and attitudes, language and communication styles, dress, food preferences and customs, time and time consciousness, relationships, values, and work ethic. This kind of cultural information is essential for developing an effective and realistic global strategy. Since conducting primary research is labor intensive and time consuming, managers may obtain preliminary information on prospective markets from books such as Dun & Bradstreet's Guide to Doing Business Around the World and Business Protocol: How to Survive and Succeed in Business, or the Economist's "Doing Business in…" series, which list potential trade opportunities, policies, etiquette, taxes, and so on for various countries. After examining the prospective markets in this manner, managers are ready to evaluate the advantages and disadvantages of each potential market. One way of doing so is the determination of costs, advantages, and disadvantages of each prospective market. The costs of each market include direct costs and opportunity costs. Direct costs are those a company pays when establishing a business in a new market, such as costs associated with purchasing property and equipment and producing and shipping goods. Opportunity costs, on the other hand, refer to the costs associated with the loss of other opportunities, since entering one market rules out or postpones entering another because of a company's limited resources. Hence, the profits that could have been earned in the alternative market constitute the opportunity costs. Each prospective market usually has a variety of advantages, such as the possibility for growth, which will lead to greater revenues and profits. Other advantages include relatively low material and labor costs, new technology gaining strategic advantage over competitors, and matching competitors' actions. However, each prospective market also usually has a number of disadvantages, including opportunity costs, greater business complexity, and potential losses stemming from unforeseen aspects of prospective markets and from currency fluctuations. Other disadvantages might result from potential losses associated with unstable political conditions. In the late 1990s after a significant amount of globalization had taken place, business analysts began to examine the success of various strategies for doing business in other countries. This examination led to the distinction between various orientations of international strategies. The main distinction was between multi-domestic (also called multi-local) international strategies and global strategies. Multi-domestic international strategies refer to those that address competition in each country or region on an individual basis, whereas global strategy refers to addressing competition in an integrated and holistic manner across country and regional boundaries. Hence, multi-domestic international strategies attempt to appeal to the needs of customers in different countries or regions, while global strategies attempt to standardize products and marketing to work across boundaries. Instead of relying on one of these strategies, multinational companies might adopt a different strategy for different products or services. For example, a company might use a global strategy for its electronics and a multi-domestic strategy for its appliances. Critics of the standardization approach argue that it makes two questionable assumptions: that consumers' needs are becoming more homogenous throughout the world and that consumers prefer high quality and low prices over advanced features and functions. 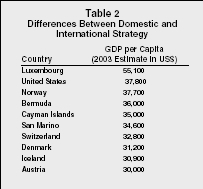 Nevertheless, standardized global strategies have some significant benefits. Companies can reduce their marketing expenditures, for example, if they use the same ads in all their markets. PepsiCo, for example, uses the same televisions ads in all of its national markets, saving an estimated $10 million a year. Besides marketing savings, global strategies can lead to other kinds of benefits and advantages in areas such as design, packaging, manufacturing, distribution, customer service, and software development. Some people argue that companies must customize their products or services to meet the needs of various international markets, and hence must use a multi-domestic strategy at least in part. For example, KFC planned a standardized approach to its foray into the Japanese market, but the company soon realized it had to change its strategy to meet the needs of Japanese consumers and customize its operations in Japan. Consequently, KFC introduced smaller pieces of foods to cater to a Japanese preference, and located restaurants in crowded areas along with other restaurants, moving away from independent sites. As a result of these changes, the fast-food restaurant experienced stronger demand in Japan. The development of regional trading blocs has promoted an emphasis regional strategies as companies develop plans to take advantage of the conditions within various trading blocs such as the North American Free Trade Agreement (NAFTA), the European Union, the Asia-Pacific Economic Cooperation (APEC) and the Association of Southeast Asian Nations (ASEAN). In addition, the United States has signed 16 different trade agreements with South American countries, creating a foundation for a trading bloc consisting of all North and South American countries. Consequently, companies have been establishing regional strategies designed around these trading blocs. Nike, for example, established central warehouses for its European distribution, just as it has a central warehouse for its U.S. distribution. This strategy has enabled Nike to reduce its inventory, cut down on redundancy, reduce costs, and enhance availability. In addition, News Corporation originally relied on a global strategy with its STAR-TV satellite television network; attempting to provide the same television shows across Asia in English. The company quickly switched to a multi-domestic strategy, providing programming in local languages after receiving low ratings and advertising dollars with its first approach. A variety of corporate collapses, and the revelation of unethical and illegal practices in many international companies, has led to a focus on Corporate Governance and Ethics in the early twenty first century. Issues of what constitutes socially responsible behavior are likely to be a major part of global strategy for the coming years. Bartlett, C.A. and S. Ghoshal. "What is a Global Manager?" In Annual Editions: International Business. Dubuque, IL: Dushkin Publishers. Feffer, J. Power Trip: U.S. Unilateralism and Global Strategy after September 11. New York: Seven Stories Press, 2003. Florini, A. "Business and Global Governance." Brookings Review, Spring 2003, 5–8. Gupta, A.K., and V. Gorindarajan. Global Strategy and the Organization. John Wiley & Sons Publishers, 2003. Punnett, B.J. International Perspectives on Organizational Behavior and Human Resource Management. Armonk, N.Y.: MESharpe Inc., 2004. The article is quiet good with good information to help the reader on more research on leadership change.But i think if there is more detial on the concept of leadership it will be more exciting to have more insight on what is in the mind of a researcher.Thanks. Very informative article, it was exactly what I was looking for.